I am very pleased to tell you that I finally got up to Darbster. Although the address says West Palm Beach, it must really be on the very edge, toeing the line of Lake Worth, because it’s south of Forest Hill Blvd. Regardless, a yummy, and completely vegan experience! Darbster is a sort of outdoors place. Even the inside seating is really a walled and covered outdoor patio. The temperature outside had dropped to around 66 by the time we got there, so it was nice that there was a table left inside. (In fact, shortly after we were sat, the last table outside came in, and they closed the sliding glass doors.) They have both air conditioners and heaters scattered throughout that they must use for more extreme weather shifts. There are a couple of high tops and seating around the bar as well. Speaking of the bar, they have beer and wine, this Organic Peak Pomegranate Ale ($6) was pretty tasty. 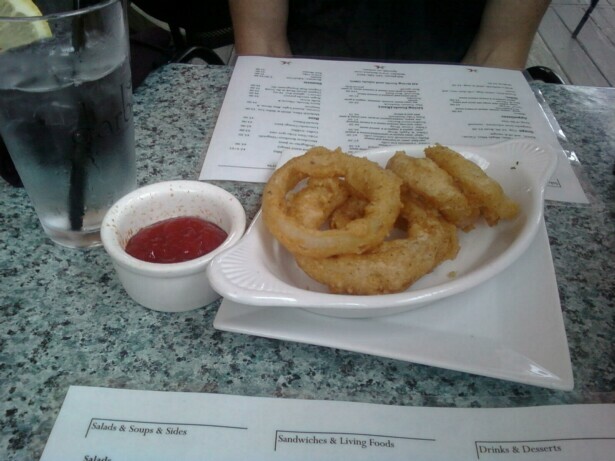 I was immediately thrilled to see that they had onion rings, and started with this side as an appetizer. Months after going vegan, I was saddened when I it dawned on me that most onion rings are dipped in egg along with that batter. Ditto for eggplant parm. So I ordered them gleefully. 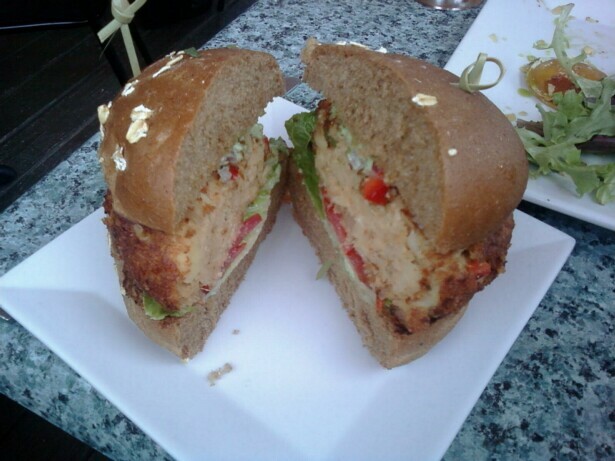 Darbster uses Daiya cheese and Gardein products for it’s meat substitutes. I’m glad they use Daiya, and I think most vegan places should, but we stayed away from the dishes that we thought were the ones I could easily make at home, like the philly cheese steak sandwich. I was really anxious to try the rawvioli. I almost forgot to order it in all my vegan restaurant excitement, but grabbed the waitress shortly after placing our order. She wasn’t afraid to let us know that we were ordering a lot of food, and I assured her that I’d take whatever I couldn’t finish home! This dish ended up being [essentially] a nice salad. The beet “pasta” had a nice crunch, and it was really tasty. 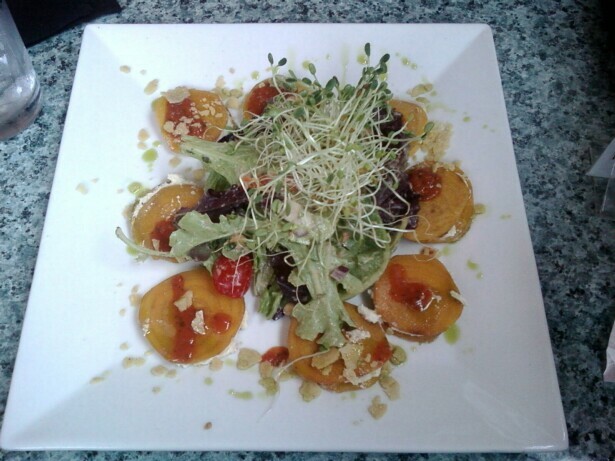 The filling was yummy and the salad was nicely dressed. I’m not sure that this would fill me up as a meal on it’s own, so I’m glad I ordered the palm cake sandwich too. One of the specials was gluten free eggplant lasagna. In fact, this was the last lunch special portion of the day, and according to the waitress, the envy of the other patrons. It was really good. 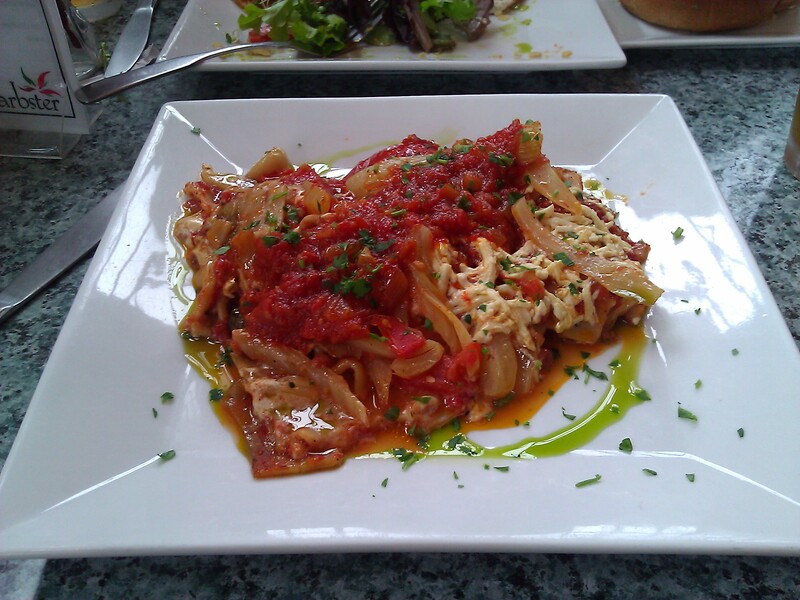 Gluten free Eggplant Lasagna… I don’t remember how much this was? $10 or $12? 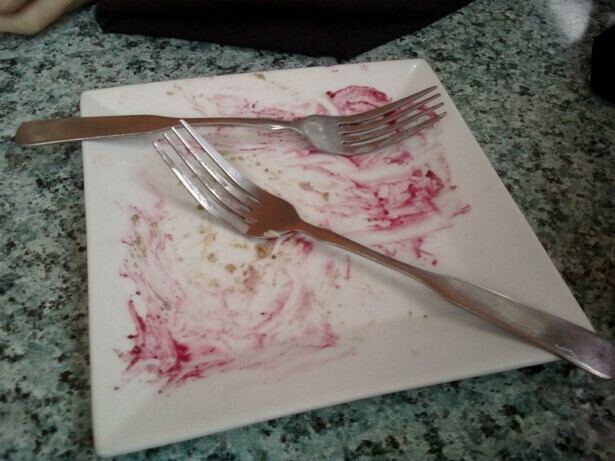 At this point I was pretty full, and boxed up half of my palm cake sandwich for later; I wanted to save room for dessert! I ordered strawberry cheesecake. I had read reviews about their awesome carrot cake, but happened to be carrot caked out, and skipped it. Then I got nervous that I made the wrong choice. I didn’t want one of those vegan cheesecakes that tastes like tofu : P Well, this cheesecake was SUPER delicious, didn’t have any tofu taste at all, and had a really good grahmmy, nutty crust. 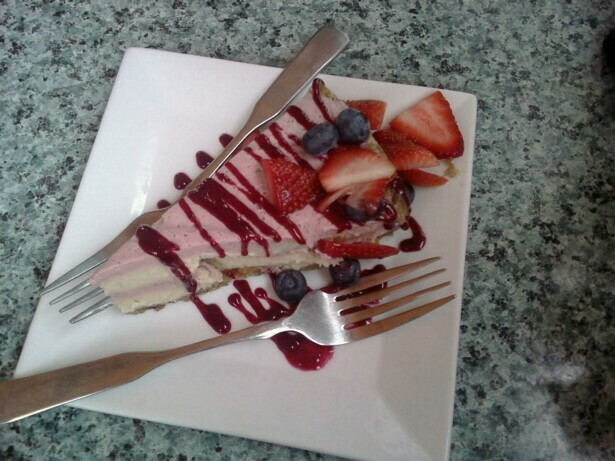 It was more of a multi berry cheesecake, and had a softer consistency than I expected. The piece was a generous size for sharing. Gone in 2 minutes flat! It was a really nice experience, and I’m glad that Darbster seems to have established itself permanently. It’s a much better option than overpriced Sublime in Fort Lauderdale, both in price and in flavor. This will definitely be a place that I’ll enjoy much in the future. Darbster is open for lunch and dinner Wednesday through Saturday (but open Valentine’s Day Monday) and brunch and dinner on Sunday. They are dog friendly, and accept credit cards too!